So you think you have the best hand on the river? Then your goal is to get as much money into the pot as you can before the rest of the players fold. This is very easy to say, however can be a lot more difficult in practise. 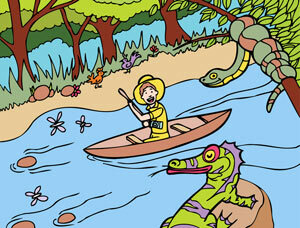 There will often be snakes, or alligators waiting on the river (your opponents!) to trick you or who will fold just when you want them to call. The game is up by the time you reach the river in poker. There are no more cards to see and you are either holding the best hand or not. If after the river card you still have nothing, then the majority of the time you should not bet or call, unless you have accurate reads on a player that suggest otherwise. You will usually have made the decision on how confident you are with your hand on the turn, and if you are confident you will probably be seeing the hand out till the end unless a bad card hits on the river, in which case you may need to re-evaluate the situation. On low limit Texas Holdem tables bluffing will more often than not get you into trouble. Bad poker players will call your bluff even with weaker hands because they feel pot committed once they get to the river – “I’ve come this far so why fold now” type of attitude. Sometimes if you are playing against a very conservative poker player you can bluff them if the river card looks like it may have helped you. Especially if it looks like you may have made a straight or a flush! But be careful that same river card may well have given your opponent the exact hand you are trying to represent by bluffing. Most poker players have tells and patterns to their play and it is important to try to pick up on these to help you decide the correct action in the right situation. You will be surprised how many players play the exact same way when they hold a strong hand, watch them closely and notice this pattern from past hands and it can help you to avoid bluffing into them when they are strong. The same works the opposite way around, by noticing how they play when they are not too confident in their hand then you can exploit this and force them to fold when the pot is up for grabs. Remember your odds of winning are better if there are fewer players still in the game. Just playing in a hand against 2 opponents instead of 1 lengthens your probability of you winning the hand extensively so when playing in a hand against multiple opponents be even more cautious. You have to analyse the board in relation to your hole cards to calculate what the best possible hand could be. If you a strong hand like two pair then it is easy to assume that you have the best hand on the river, but you can’t just assume that, you need to look at all the factors and make an informed decision. What other possible hands are out there that might have connect with the board, and how likely judged on the actions that each player has taken and what you know about them is it that one of your opponent holds that hand? Keep a close eye out for possible flushes or straights and how coordinated the board may be. Keep in mind that if a pair is on the board then any of your opponents could be holding a full house. Exploring all the possibilities is a mindset that you need to get into if you want to be a successful poker player. Poker is not just about the hand that you hold, but also about the hand that your opponent holds, you don’t have to be holding the best hand to win a pot, and you don’t have to be holding the worst hand to lose a pot, it’s all about assessing the situations that you are in and acting in the most profitable manner, or in the manner that limits your loss in that situation. So we have established the reasons why there is no black and white method to playing the River and how it’s very situational depending on your opponents and the cards in play. To play the river card correctly requires that you have a plan for the hand from the flop. If you have a strong hand that you have confidence in then you should be looking to get value out of each betting round and planning to get money into the pot at every opportunity, correctly sizing your bets so that you get your opponents to call without scaring them off. By building the pot in small increments throughout the hand this then allows you to place a slightly larger bet on the River by which time the pot will be quite substantial making your opponent feel committed to call with a worse hand. Don’t get fancy. If the other players in the game are calling stations just make nice sized value bets that you think they will call. Get money into the pot when you know you have got your opponents beat. Learn to fold and check call the river when you are not so confident holding a weaker hand that is easily beatable. Once you know your opponents way of playing, then you will know how to play against them. When playing an aggressive poker player and you feel that your hand is superior, then raise into this type of player. If you are playing a conservative poker player and they bet heavily into you, then you should probably strongly consider folding. What differentiates winning and losing poker players has a lot to do with how well they play the river, since any mistakes that are made during this betting round get amplified as the pot is already so big. So focus on watching your opponents tells and betting patterns and combining that with your reading of the hand in play to enable you to have a clear plan of action throughout the hand culminating in that perfect winning play on the River.